The Candy Factory new location! Our story about the move was featured on NBC and can be seen here. Come down to Burbank and check us out. Along with a new store, a new website will be coming soon. Stay tuned! DANDY DON’S award winning homemade ice cream! The Candy Factory first opened in 1978 in the same shopping strip we are still located in today. 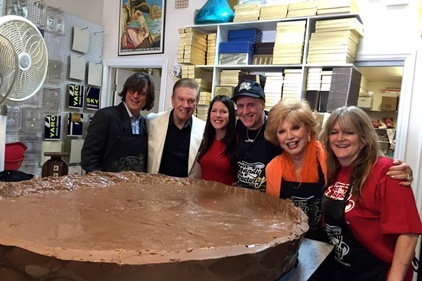 Known as the Candymaker to the Stars, the Candy Factory has made chocolates for the who’s who of Hollywood. Our client list includes Oscar,Emmy, Tony, Grammy, Olympic & World Champions from around the world. We created the candy Tom Hanks eats in Academy Award winning movie Forrest Gump and the wedding favors of Michael Jackson & Lisa Marie Presley. We were even sued by the Academy of Motion Pictures for making chocolate Oscars. We created the original Chakalates for Chaka Khan. We also teamed up with Olympian and World Champion Pairs Figure Skater Tai Babilonia on her line of “Tai Treats”. Most recently, we’ve teamed up with Susan Olsen (aka Cindy Brady) on her new confection line of Candy Puppy Poop & Kitten Crap. We make the official VIP favors for opening night at The Hollywood Bowl every year. Let The Candy Factory -Candymaker to the Stars make your next event a red carpet affair! !